PS22 Choir Performing With Carrie in Newark Tonight!!! Thread: PS22 Choir Performing With Carrie in Newark Tonight!!! opry051008, CarrieUnderwoodismyHero, Smokyiiis and 6 others like this. Oh Tee, thank you for that wonderful post. How lucky for those children. Smokyiiis, teesharky and rainbow1 like this. I WILL NEED VIDEOS OF THIS! opry051008, CarrieUnderwoodismyHero, Smokyiiis and 4 others like this. I hope the children and their families didn't too much damage from hurricane sandy. This is soo amazing for them!! What a wonderful opportunity for Carrie to give them!! I wonder what song she will sing with them? When she visited them they did SS and GG but GG is the opening song and I don't think they will do that with her and she doesn't sing SS on tour. I guess we will see. I so need videos of this! I have loved the songs Carrie has sang with them and I go watch them every so often because they are so good. So this ought to be good! And so much fun for the kids!!!! Can anyone tell what their tshirts say?? I wonder if this is a charity thing for Hurricane Sandy? It would make sense. Maybe they will sing So Small or one of her more inspirational songs. That choir sure gets to do some cool things. teesharky, liz278 and rainbow1 like this. I don't think that anyone needs to worry about there being videos, I am sure there will be plenty of them. I wonder why they did Newark instead of the Long Island show last night? They are from Staten Island, right? It must be something special for NJ for Hurricane SAndy. Yea, but probably easier to travel to Newark. CarrieUnderwoodismyHero, teesharky, glenn7 and 2 others like this. 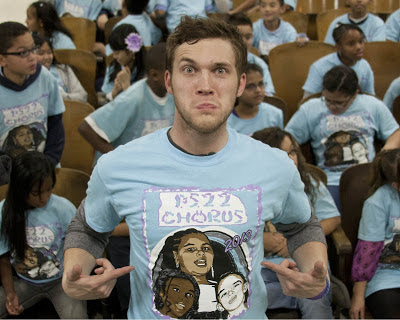 PS22 is the luckiest chorus ever! Very cool opportunity for them. Carrie comes up with the most wonderful ideas!!!! oh wow did they? I missed it on twitter. Was it for charity or something? omg that's amazing...need video of this!! So Small makes a return! I wonder if she didn't sing temporary home? or if she just added a song. Hollie IS performing Carrie on Idol Tonight- Confirmed! !